We have done a lot of research on tiny houses and people often ask about the rules about having your tiny house on your property. Can I put a tiny house on my property? Yes, in most cases. You may have to change the way you build your house in order to comply with your local rules and regulations. It also depends on which state you live in and whether it’s the primary house on the property. The rules and regulations will be different not only based on the area you’re in but also by the type of tiny house you decide to build. Typically, you’ll experience more resistance to building your tiny house when it will be the only house on the property. This resistance can come from the local government as well as the neighbors. Tiny houses built on properties that already hold primary residences will also have different rules versus tiny houses built on vacant land. Let’s start by looking at houses on foundations. A tiny house built on a foundation is usually just a miniature version of a typical home. This house will be built on a concrete foundation and often-times the builders will use standard framing techniques. What I mean by this is that the home will be framed out with 2’x4′ lumber. These will normally be placed every 16″ from the center of the house. A tiny house with a foundation and 2’x4′ framed walls will be just as strong and durable as your average house. It will have room for standard sheets of insulation and the builder will not have to worry about creating or finding special materials. A tiny home is considered a primary residence when it is built on property that does not have any other homes on it. It is considered a secondary home when it has been built on a property that already has a home on it. Homeowners adding a tiny home to a property usually have a much easier time than ones who are building a tiny home as their sole residence. This is especially true in more urban and suburban areas. The reasons for this vary, but I suspect local governments frown upon homes that are smaller because it lowers the tax revenue for that particular piece of land. In most areas, the larger the home, the more the homeowner pays in taxes. If a person only builds a 300 square foot house with one bathroom and one bedroom, the government can’t charge them as much in taxes as they would a person who has built a 2,000 square foot home with 4 bedrooms and 2 bathrooms. Additionally, neighbors will sometimes complain when people try to build small homes in areas where most homes are larger. They feel that the smaller home will be worthless and that this will, in turn, lower the value of their own home. Building a tiny home on a foundation as a secondary dwelling is usually much easier because they tend to add value to the home and increase the homeowner’s tax rates. The neighbors remain happy and the government gets a bigger check each year. Not only this, but homeowners can disguise this type of house as a garage or a pool house. Neighbors are less likely to complain when your tiny house does not stand out. In many ways, tiny houses on foundations can be easy to build. These homes are also very flexible in that they can be tied to the grid or built to be off-grid. Since the home is built on a foundation with standard framing techniques, the plumbing, and electrical systems will not differ from that of a standard home. Off-grid tiny houses on foundations can be even easier to set up. Since the home is small and stationary, the home builder does not have to worry about the weight of the batteries, the water tanks, or the solar systems. In fact, a tiny home on a foundation can have its own well, it’s own septic tank, and a solar shed that is built to house the homeowner’s solar battery bank. Since the tiny house will not be moving, it tends to hold up longer than it’s counterpart with wheels. This is because the tiny house is not exposed to heavy winds as often. It also does not have to absorb the impact of the road with each passing trip. Because of the availability of parts and the higher longevity of tiny homes on foundations, they usually end up being much less expensive to own. One of the biggest disadvantages to a tiny house is the fact that it cannot be moved. Homeowner’s with tiny houses on foundations may also have to comply with local building codes. Complying with local building codes can limit what a tiny homeowner can do with their new home. Not only this, but some towns may even have minimum size requirements. Depending on your definition of a tiny home, you may not be able to build one on a foundation at all. There are two main types of tiny homes that can be built without foundations. The first one is a tiny home on wheels and the second one is a tiny home built within a pole barn. Both of these types of homes can often be found in areas where a tiny home on a foundation might not be permissible. Tiny homes on wheels are exactly what they sound like. They are homes that are built on top of trailers. They can range anywhere from as short as 10 feet long to well over 35 feet long. A tiny home on wheels tends to be what most people are referring to when they talk about tiny homes. There have even been communities that have been built to accommodate these types of homes. 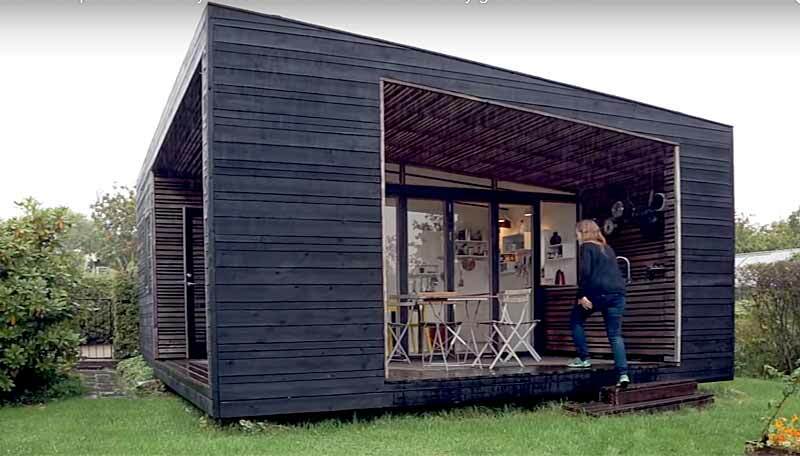 A tiny home on wheels is mobile. I’ve seen people buy tiny homes and Uhaul trucks to pull them so that they can spend all of their time traveling. This is especially great for people who work jobs that force them to travel on a regular basis. They can move every few months without ever having to leave their home behind. Tiny homes on wheels are often legal to own in areas where they would not be legal to build on a foundation. The reason for this is that the local government considers them trailers rather than homes. This means that they also do not have to comply with local building codes. A person can use whatever materials suit them and they can make the tiny home as individualized as they like. In addition to all of this, a tiny home can usually be sold for more than it cost the original owner to build. This means that the careful DIY tiny homeowner gets to live in a house for free and then make a profit when he/she decides to sell. The main drawback to a tiny house on wheels is that it has to be built on a trailer. While a foundation provides a solid and reliable base for your tiny home, a trailer often does not. Trailers have a maintenance schedule that foundations do not have. This is because a trailer will rust and tires will eventually dry-rot. Also, if the homeowner decides to do a lot of traveling, the house may be subject to wind and road conditions that a normal home would not have to contend with. Because a house on wheels must be built to withstand conditions that a home does not have to contend with, it has to be built differently. Not only this, but it’s plumbing and electrical systems will need to be hooked up to the grid like an RV rather than a standard home. This adds to the cost and complexity of the build. A traveler with a tiny house will also have to consider how they will tow their tiny house. This means that the builder will need to worry about the weight of the tiny home as well as the tow rating of their vehicle. Pole barns are buildings that are framed off of posts that are dug at least three feet into the ground. These buildings do not have foundations, so they do not fall under the same building codes that other tiny homes do. For the most part, these houses share the same advantages and disadvantages of other tiny homes built on foundations. The exception is that these are less durable but easier and cheaper to build than homes on foundations. Before planning out your tiny house build, make sure you check with your local government. This way you’ll know what you can build and where you can build it before you invest any time or money.